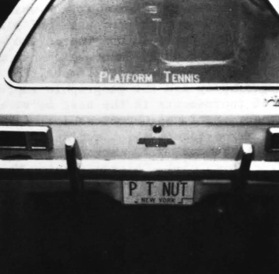 Charles “Chuck” Vasoll has given a lifetime of service to growing platform tennis through his involvement with the Long Island Platform Tennis Association (LIPTA) and the APTA. He was credited with establishing a firm financial footing for the APTA at a time when the Association was facing difficult times. 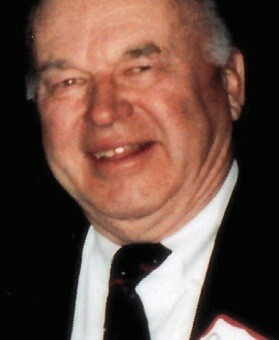 Vasoll served on the APTA Board for 13 years, starting in 1987, when he replaced the retiring Gerald Manhold. He was elected President in 1988 and ended up serving in this position until 1992. Among his many accomplishments was hiring Ginna Ohlmuller as Executive Director, and getting the association’s activities organized at a time when crucial things, like membership records, the newsletter mailing list, and the group’s finances were all in disarray. With help from Bob Brown, he also brought back the Honor Awards after an absence of 12 years. Locally, Chuck served for more than 20 years on the LIPTA Board, including as its President from 1996-1997, and as its Treasurer from 1998-2007. He was the Grand Chairman of the 2002 APTA National Championships, held on Long Island, a notably successful event. He has also served as Secretary/Trustee on the Platform Tennis Museum and Hall of Fame Foundation from its establishment in 2002 until 2012. Vasoll took that passion and commitment to his responsibilities as a leader within both the local and national organizations serving the sport. As part of his efforts to return the APTA to a solid financial footing, he undertook two initiatives, the most important of which was initiating League memberships in the APTA, starting with his local organization, LIPTA. Gradually, other league memberships were formed and the success of the program largely contributed to the financial survival of the APTA. He also developed a marketing program for APTA products that produced some sorely needed revenue for the association and support for tournament directors. On his watch, the APTA also began awarding National Championship medals in all categories. Recognizing the value of such an honor, Vasoll offered medals to all past champions as well. Chuck also saw that the Executive Director really did not have enough time to act as editor of the APTA flagship newsletter Platform Tennis News on top of all her other responsibilities. Luckily, he discovered that one of the new APTA Directors, Brian Zevnik, was a professional editor and, after suitable arm-twisting, he took on the assignment. Chuck commented: “There are no words to describe what a fantastic job he did in this position during the four years I served as President. I learned so much from him that when he succeeded me as President in 1992, I became his newsletter editor. We both spent a considerable amount of time on the publication but, while it was a challenge, it was also fun.” Vasoll devoted many hours as both an editor and a photographer to making Platform Tennis News excellent. Chuck was re-acquainted with Brian Zevnik in 2008 on a visit to The Landings in Savannah, GA. The community has a cadre of retired platform tennis players from the Northeast and Midwest who have now been able to renew their love of platform tennis with the two courts recently erected there. Ironically, George Anderson, the guy that introduced Chuck to the sport back in 1975, is Brian Zevnik’s neighbor. When he first became involved with the APTA, Chuck was unemployed because the bank he worked for was purchased by another. With time on his hands and love of platform tennis in his heart, he concluded that nothing could be better than being part of the parent organization of the sport. This was a fortunate development for the APTA. Despite the fact that Chuck had to commute to Montclair from Long Island, he devoted long hours for many months working with the new Executive Director. Future APTA Presidents were very grateful for the solid foundation for the Association and gave him due credit. 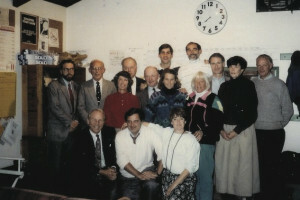 A 1993–94 APTA Board of Directors meeting at the Montclair Golf Club Paddle Hut. The Vasoll era had ended and Brian Zevnik was now President, but Chuck stayed on to work on Platform Tennis News. Standing back row: Reb Speare, Bob Brown, Chuck Vasoll, Peter Dodd, Walt Peckinpaugh, Pete McCormick, Carol York, and Bill Childs. Standing second row: Hope Kerr, Charley Stevens, Claudia Neal, and Nancy Mangan. Kneeling: Howard Sipe, Brian Zevnik, and Ginna Ohlmuller.